"Which is the Virgin? Which is the Vampire?" 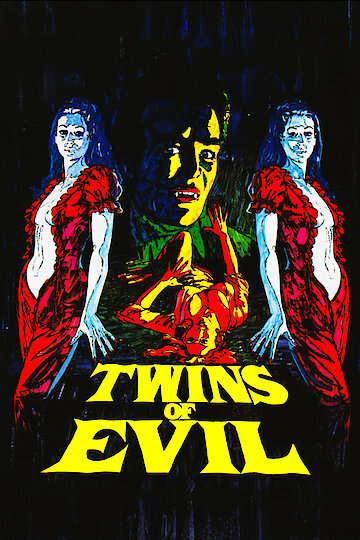 Twins of Evil is a 1971 horror film starring Peter Cushing and Damien Thomas. The film is the final part of a trilogy of films called The Karnstein Trilogy. The Trilogy is based on the vampire tale Carmilla. The plot centers on twin orphaned teenage girls who move to Karnstein in Central Europe to live with their uncle Gustav. The film blends vampire themes with witch themes, The real focus of the film is the contrasting good and evil natures of the two sisters. It plays down the vampire lesbian elements that were popular in the two previous films. Twins of Evil is currently available to watch and stream, download, buy on demand at Amazon Prime, Amazon online.